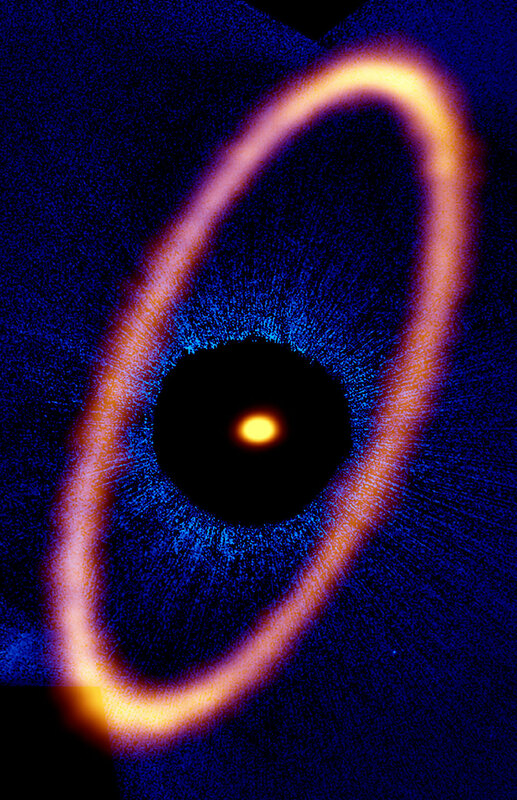 Composite image of the Fomalhaut star system. 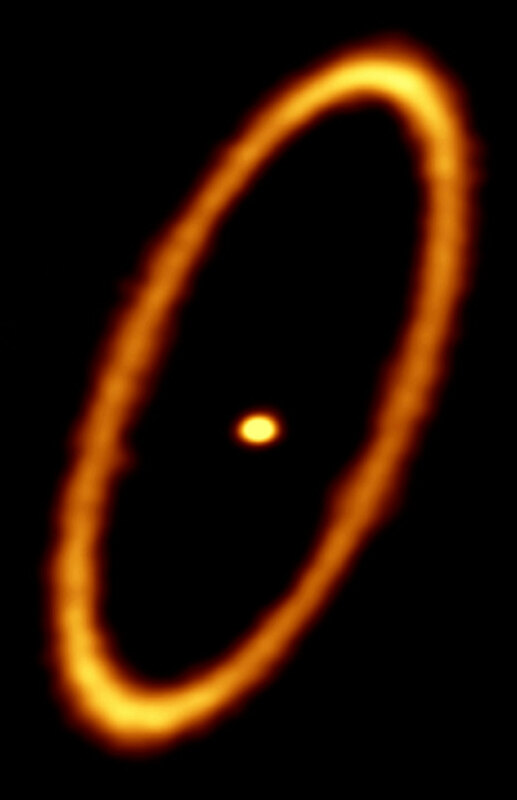 The ALMA data, shown in orange, reveal the distant and eccentric debris disk in never-before-seen detail. The central dot is the unresolved emission from the star, which is about twice the mass of our sun. Optical data from the Hubble Space Telescope is in blue; the dark region is a coronagraphic mask, which filtered out the otherwise overwhelming light of the central star. Using the Atacama Large Millimeter/submillimeter Array (ALMA), an international team of astronomers has made the first complete millimeter-wavelength image of the ring of dusty debris surrounding the young star Fomalhaut. This remarkably well-defined band of rubble and gas is likely the result of exocomets smashing together near the outer edges of a planetary system 25 light-years from Earth. 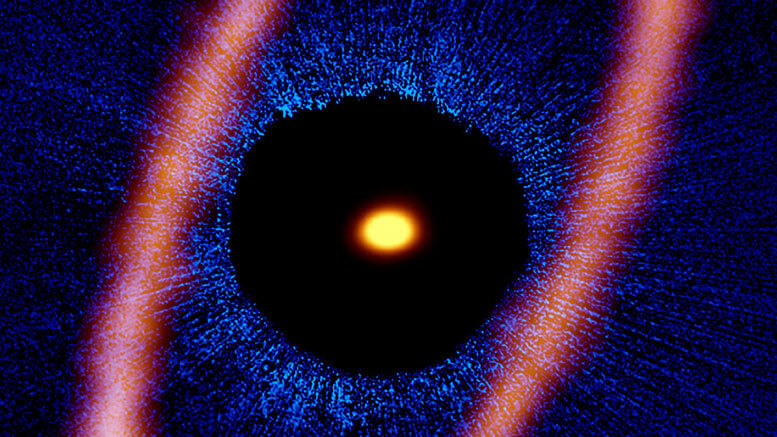 ALMA image of the debris disk in the Fomalhaut star system. The ring is approximately 20 billion kilometers from the central star and about 2 billion kilometers wide. The central dot is the unresolved emission from the star, which is about twice the mass of our sun. The new ALMA observations are also the first to definitively show “apocenter glow,” a phenomenon predicted in a 2016 paper by lead author Margaret Pan, a scientist at the Massachusetts Institute of Technology in Cambridge and co-author on the new ALMA papers. Like all objects with elongated orbits, the dusty material in the Fomalhaut disk travels more slowly when it is farthest from the star. As the dust slows down, it piles up, forming denser concentrations in the more distant portions of the disk. These dense regions can be seen by ALMA as brighter millimeter-wavelength emission. 2 Comments on "ALMA Views Fomalhaut Star System in Never-Before-Seen Detail"
Why is there “No” credit to the facility being an ESO telescope? Not once is ESO mentioned in this article. Whatever the who or what or where about the science behind this article, the big questions about the image are: What is the black not-quite-a-circle at the middle of the image? If it’s a mask over the star, why isn’t it round, and what is the not-quite-a-circle of “unresolved emission” at the center? (What is “unresolved emission”?) What are the (blue) rays surrounding the star? Can we see an artist’s impression that gives us a 3D rendering of the blue rays and orange ring? How do they fit or work together?